The “heat” is on as the saying goes, and the fishing is HOT! 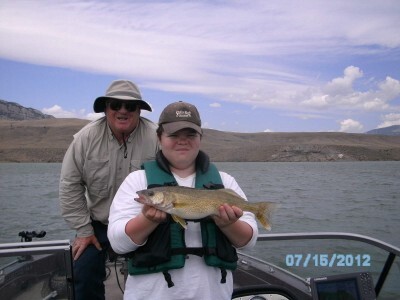 The opening of the west end of Buffalo Bill Reservoir last Sunday started a daily boat parade through Cody. Everyone has been having great success trolling for trout and it doesn’t take long to get your limit. Be sure to read the regulations carefully if you’re fishing there for the first time. As we are well into July and many of you have been on the water a lot, some mid season boat/trailer maintenance is in order. I spent today washing and cleaning with plenty still to do. Several things that should be checked include; engine oil on 4-strokes, lower unit gear lube levels, trailer tire air pressure, trailer axle bearing grease or lube and of course tightening screws, nuts and bolts. Vibration plays havoc with everything we want to stay in place. I know each of you have other items you take a look at from time to time. Time spent now could save a ton out on the road. Check your safety gear, especially your fire extinguisher…with the HIGH fire danger, we all need to be aware of our actions. Something as simple as pulling off the road to check the boat trailer could be disastrous if the tow vehicle’s muffler were to ignite some dry grass. boat and the fish was HUGE”. The photo sent in with this is of 15 year old Nathan and his grandfather Darrell. They were guests on my boat last weekend. The fish is a 21 incher, Nathan’s first walleye! Remember, if you have a chance, “Take a Kid Fishing”!